Is There Turmoil at Chelsea and Who Is to Blame? There are many questions being asked about the situation at Chelsea, and who is to blame for recent lacklustre performances, more notably the 6-0 demolition job Manchester City inflicted on the West London outfit. Previous away performances include 6-0 loss against Manchester City, 4-0 loss to Bournemouth and a 2-0 loss to Arsenal – an aggregate scoreline of 12-0 in our last three away league games clearly shows something is not right at Chelsea. The question every Chelsea fan is asking right now – who is to blame? The first suspect everyone points the finger at first is the manager, Maurizio Sarri. A manager appointed by Chelsea who has yet to win his first major trophy with a club. Chelsea arguably have the best CDM in the world in Ngolo Kante but he’s continually being forced out of position by Jorginho. Yes, Kante has scored more this season than in his previous two seasons but it’s easy to see that Jorginho has struggled in recent games. Sarri stubbornly continues to play Jorginho in this position and will not try new formations or swap key players around. 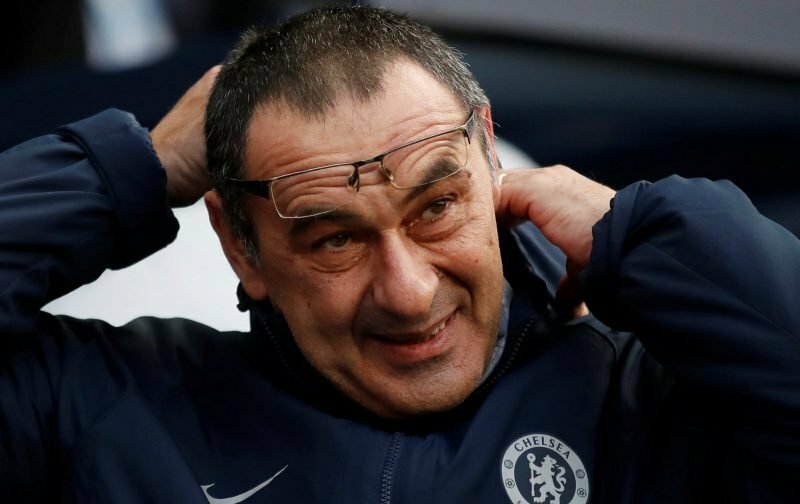 If he continues to play the same team, it is likely Chelsea will not make top 4, with Sarri being another manager shipped out by the powers above. Chelsea arguably have one of the best youth academies in the world, as well as one of the longest list of players out on loan in the world. So much youth is being wasted when Chelsea’s team is crying out for goal scorers, wingers and a decent left back. Chelsea are in desperate need for a goal scorer, Tammy Abraham on loan to Villa has registered 20 goals this season. Alonso continues to struggle at left back, while Reece James impresses on loan at Wigan. Pedro and Willian are inconsistent, Hudson-Odoi continues to be left out the squad on the back of Chelsea rejecting multiple offers from Bayern. Youth players need to be utilised especially when regular first-team players are underperforming. Other teams such as Liverpool and Tottenham successful bring youth through to the starting 11 so why do Chelsea continue to struggle. The management board at Chelsea is somewhat disorientated. Roman’s visa constraints mean he can no longer watch his team that’s he has invested heavily in over the last 16 years. The clubs transfer policy is now managed by Marina Granovskaia. Marina successfully bought in the likes of Jorginho and recently purchased the USA international Pulisic. Jorginho was clearly a Sarri signing, but the appointment of Pulisic seems to be a transfer made by Marina rather than Sarri. Sarri needs to be given full control of transfers in order for his philosophy and ideas to take full effect. Will history repeat itself once again with another manager being shipped out the doors, or will the board stick with the manager and give him time to deliver results? Only time will tell. Stupid, clueless owner. He brought the club into the modern age, and then didn’t have enough sense (or lack of ego) to develop it any farther. My man. Glad somebody gets it. @solid7, for all d ills n evils of Roman . Any tested n trusted manager is suppose to adapt 2d types of players he has . U cant just come in n force square pegs in round holes . D Epl is Very dynamic, teams are easily found out, and once this Happens to u, u must adjust accordingly . For all d noise of wat sarriball is all about, we still rely on Eden for his unique abilities to save us . And incase u haven’t noticed, d manager is yet to get d right mid-field combo n placement , dats why our defence suffers . Dats also why we are too predictible n too slow on the transit . No bite, no gel, no vibe . And d manager (sarri ), is too “professional ” to see this . We shouldn’t have sacked conte . Atleast he understands the trade better than this sanctimonious sarri . He will eventually take us 2d 10th position, if we dont quickly cut him off . Hes Obviously not a top 4 epl manager. Hes not adaptable. Hes simply a theorist, a philosopher . Any striker will suffer in this system. For all our sins, We still deserve better than Sarri. @EVANS – your first mistake is not understanding why we are in the situation that we are in. I won’t address any of your points, as there’s no point in debating on a daily premise. With the state of our club, you can bring in any players or manager in the world, and you’ll get the same results. By the way – the mark of a well run club isn’t winning the league. It’s competing consistently (and well) in European competition, while also being at the top of one’s own league. Want to be taken seriously? Win a league, back to back, and finish in the UCL finals, every year of the same period. That’s your mark of greatness. That should have been “faulty premise”, not “daily premise”.